1970 Camaro is an icon in the Classics world and continues to be heavily sought after. It’s time once again for another episode of “Clash of the Classics. This time it’s the 1970 Camaro vs 1970 Charger. The 1970 – 1981 Camaro was the second, and longest-running generation, and it was a huge departure from the earlier, first generation Camaro. The Z/28 model had become a household name, and now carried the first iteration of the LT1 engine. The Z/28 had a 350ci engine and the SS and RS packages were also available with engines ranging from the anemic 250ci six cylinder to the 396ci big block. For 1970 most of the engine and drivetrain components were carried over from 1969, with the exception of the 230 ci six cylinder. The 1970 Camaro SS 396 was awesome and rated at 350 hp. Beginning in 1970, the big block V8s were actually displacing about 402 cu inches, yet, for some reason, Chevrolet chose to keep the 396 badges. The LT-1, an engine built from the ground up using premium parts and components, ran far better than the earlier 302 that was used in the 1967-69 Z-28s and the Turbo Hydramatic 400 automatic transmission was an option to the four-speed manual for the first time. One interesting point was the 2nd generation, for some reason, was never offered as a convertible type model. The interior featured a new instrument panel that had several round dials for gauges. New bucket seats, unique to 1970 models, had squared-off seatbacks and adjustable headrests, and the rear seating consisted of two bucket cushions and a full length back seat. Some center consoles came standard with a Hurst shifter, and the standard interior featured all-vinyl upholstery and a matte black dashboard finish. There as an optional interior choice that came with woodgrain trim on dash and console. The suspension was less than memorable and cornering was not exactly what you might expect from an American Sports car but, it was sufficient for the time. Weight distribution across the platform wasn’t exactly perfect nor was the steering. Body roll was more of a problem than GM expected and serious performance enthusiasts began to give up on the gen 2 Camaro. It wasn’t until much later that General Motors took a serious look at the Camaro’s shortcomings and begin to implement solutions. One thing seems certain, of all the 2nd gen Camaro’s most would agree, the 1970 is the most desirable. Now, let’s talk about the 1970 Dodge Charger, it was a tad late to the pony car party but still one of the coolest muscle cars ever to come out of Detroit. The 1970 Plymouth Barracuda and the 1970 Dodge Challenger were some heavy competition and they were from the same manufacturer. The Charger was a little bigger and a bit better appointed interior wise than the Challenger or Barracuda and some would argue it’s a bit more luxurious but regardless of your opinion one thing is clear and that is the 1970 Dodge Charger was a beast. There were a number of engine options ranging from the 225 slant six up to the mighty 390 horsepower V8 440-6 pack. The little slant 6 had surprising torque and the 426 Hemi was a beast with arguably no equal. The 440 with three 2 bbl carburetors is still heavily sought after today and whether you were a fan of the manual or the automatic, Dodge had the transmission to get the job done. The Torqueflite 727 automatic transmission was so reliable and such a performer, Dodge used a variation of it well into the mid-2000’s. The little Torqueflite 904 saw duty for a few decades. Differentials were reasonably rugged and the 3.23 ratio was one of their proven performers. 1970 was the last year of the 2nd generation Charger and Dodge implemented a few minor changes. 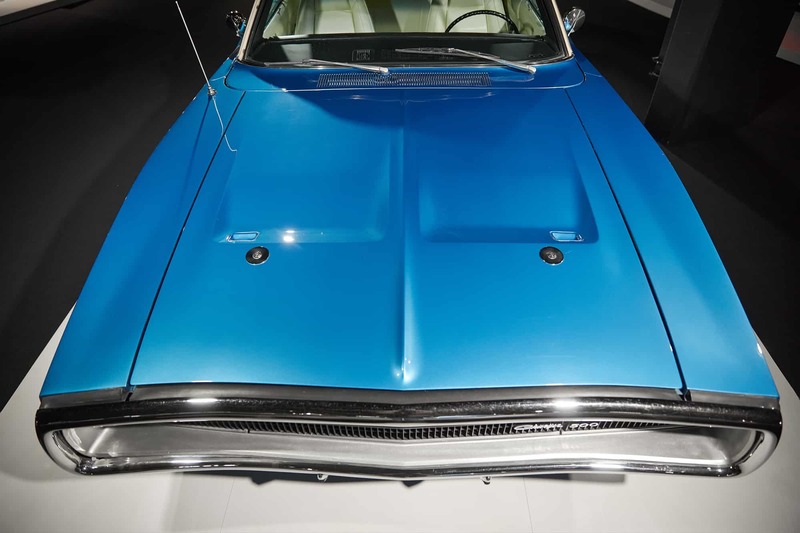 The vacuum style headlight doors were replaced with a newer style of electric headlight door.The taillights were similar to those found on the 1969 models and the R/T versions came with a new, more stylish taillight panel. The interior was one of the coolest of the time period with all-new bucket seats, revised door panels with a sport style dash that was a bit unusual as the instrumentation was asymmetrical. Many argued the gauges were laid out in an odd, nondescript fashion while others felt it was unique and sui generis. The all-new pistol grip shifter was introduced, the ignition was moved from the dash to the steering column, and for the first time ever, a bench style seat was available. Whether you’re a fan of the 1970 Camaro or the 1970 Charger, either way you end up a winner as both of these iconic models are worthy ambassadors to the classic car world. I vote for the charger! The 2nd gen Camaro was cool but never quite what the 67-69 was. The Charger was AWESOME!!!!! Even the newest charger is incredible!! Thanks for your vote and it was great meeting you! All of us here at Horsepower Broadcasting agree, the Charger is cool!! Telling you that you’d get a better insteert rate by purchasing a warranty is the second lie they told you. The first one was lying about the cost.Yes you should be able to cancel the contract but expect some financial loss. There will be fees and charges that you will need to pay.The paperwork that you waited several days to read should have been read thoroughly in the finance managers office at the dealership before you signed them.It is the consumers responsibility to read and understand all the terms of any contract BEFORE you sign them, not several days later.The dealer doesn’t have to cooperate. You willingly agreed to the $3900 cost.Dodge offers a 3 year unlimited and a lifetime limited powertrain warranty on that new vehicle, why did you feel obligated to purchase something they provide for free with every car they sell. I’m mopar all the way, hands down The charger! I sure wish I had kept my 1970 Charger. I lost the battle when it was too hard to get a baby in a car seat in the back seat. It only had a 318 but I did see 145 Mph on the 150 Mph speedometer once. It had more to go but I confess I chickened out. Before anyone asks, I was by myself, no the baby was not with me. I pass one sitting in a driveway twice a day on my way to work and back. One of these days I’m gonna stop and see if they want to sell it. The 318 was Chrysler’s ” go to ” V-8 for MANY YEARS. ABSOLUTELY BULLETPROOF . . . Yes you can. All you have to do is notify the delear in writing along with the miles on the truck requesting to cancel the warranty. The money will be sent to the lender to reduce the payoff and your payments will stay the same. It will come off at the end of the loan. so if you financed your truck for 60 months and cancel a $3900 warranty you will have less payments, so I would suggest calling your bank around payment 50 t see how much more is owed on the vehicle. If the delear still don’t cancel the warranty for you than call the warranty company and tell them the delear is refusing to cancel it. It is against the law to tell a customer they can get a lower interest rate by taking advantage of the warranty, so if you can prove it, I would talk to a lawyer. That picture of the Charger is a 1968 RT, not a 1970. I know because I used to own one when I was oung , stupid and cash poor. Absolutely correct, Mike. The 1970 is the model that Dodge used mostly to retro the current Challenger.